To some, Comic-Con is a sweaty heap of pulsating fans. To us, it's a galleria of delights and treasures waiting to be uncovered. But the goodies are hard to find. So we're taking the guesswork out of navigating the Con floor. Here's our list of the best things to buy at this year's Comic-Con, complete with booth numbers where you can find them, and how much they cost. Artist Alex Pardee holding Captain America inspired poster titled "The Patriot." Mondo is running an exclusive print every day of Comic-Con (the next picture is an amazing Cthulu image from Preview night). Posters are running from $40 for a single print to $400 for a set of Star Wars posters. They're gorgeous. Mondo Tees Preview Night Print (there will be a new image each day). The creators behind Penny Arcade (Jerry Holkins & Mike Krahulik) are on hand all weekend at their booth to sign new books, posters and DVDs. Star Wars Ice Cube Trays – Now you can pretend you are Boba Fett every night. Masters of the Universe Polly Pocket set – I'm not sure why these exist, but they are really damn cool. Frank Koniz's ceramic Heathrow the Hedgehog, new for Comic-Con and limited to 25 of each color. Koniz's Smoking Rabbit King of Rock, which gives the classic vinyl toy a touch of KISS. 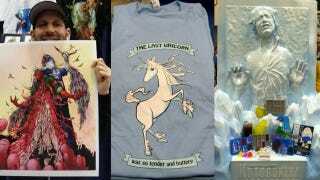 Alaska Robots makes its Comic-Con debut with this irreverent t-shirt take on The Last Unicorn. This gentleman eel is just one of many aristocratic animal prints from The Fun Machine. I Heart Guts has several new plush organs debuting at Comic-Con, including this stuffed intestine (with an adorable, if vestigial, appendix). Tentacle hair combs from artist Echo Chernik add an eldritch touch to anyone's hair. Keep the TARDIS close to your heart...and stomach...and legs with this dress from Pendragon Costumes. Toymaker Funko debuts four Disney/Pixar Comic-Con exclusive toys this year, including a glow-in-the-dark Mikey and a retro Mr. Incredible. Mimobot adds to their line of flash drive characters with bounty hunter Bossk, Han Solo in carbonite, and the Batman: Arkham City edition of Harley Quinn. Tara Strong, who voices Harley in the game, will be doing a signing at the Mimobot booth this week. The team from Cyanide and Happiness will be around all weekend to sign their wares! Price: $5 to $20 for prints, shirts, plushies and posters. This is the 7th year at Comic-Con for the Crazy Crazy Contacts lady (officially titled the Contact Lens Store). Go say hi, she's great, and buy some of her awesome cat lenses. Alex Pardee Human Centipede Art (new for Comic-Con, along with Gizmo and the Queen Alien prints). 1,000+ Caras lucha libre masks! I-Mockery Pixel Posters packed with pop culture references. A dark t-shirt from Grant Morrison's new Sinatoro movie. Booth: Follow @sinatoro on Twitter for details on where to get yours. Quick and easy Star Trek cosplay (also great for day wear). These decorative embryo pillows by artist Miso are sure to confuse or delight your houseguests. Grumpy Heart Bear gets even grimmer in this print from Imaginism Studios. Adult Swim brings a new round of must-have Venture Bros. figurines, including classic Dr. Girlfriend. This Comic-Con exclusive poster is limited to 300, with a randomly distributed 25 prints signed by Matt Groening. Jayne Cobb wore this psychedelic pinup tee, and now, thanks to Quantum Mechanix, so can you. Erika's Walton's toy dinosaur earrings go in one ear and out the other. What's better than a kitten with a jetpack? A kitten with a jetpack covered in glitter.